Norfolk and Suffolk NHS Foundation Trust (NSFT) has published its papers for the Board of Directors meeting on Thursday 22nd September 2016. Overall, the number of SIs over the past two years has shown fluctuation, but the control chart shows that there has been no trend or special cause variation. Overall, 90% of SIs are unexpected deaths, and we similarly see that there has been no increase or decrease in trends, or significant variation. But what should be a dispassionate examination of safety data is in fact spin over substance. In 2012/13, there were 161 Serious Incidents (SIs) of which 53, later revised to 88, were unexpected deaths including natural causes. So, 55% of SIs were unexpected deaths including natural causes and there were on average 7.3 unexpected deaths of people under the care of NSFT per month. In 2013-14, there were 172 SIs of which 105 were unexpected deaths including natural causes. So, 61% of SIs were unexpected deaths including natural causes and there were on average 8.75 unexpected deaths of people under the care of NSFT per month. In 2014-15, there were 228 SIs of which 139 were unexpected deaths including natural causes. So, 61% of SIs were unexpected deaths including natural causes and there were on average 11.6 unexpected deaths of people under the care of NSFT per month. In 2015-16, there were 216 SIs of which 157 were unexpected deaths including natural causes. So, 73% of SIs were unexpected deaths including natural causes and there were on average 13 unexpected deaths of people under the care of NSFT per month. It will be interesting to see how NSFT tries to spin the 13% increase in unexpected deaths in just one year in its 2015-16 Annual Report to be published next month. In the first five months of this current 2016-17 year, there have been 86 unexpected deaths including natural causes. There have been on average 17.2 unexpected deaths of people under the care of NSFT per month. Based upon extrapolation of the first five months of 2016/17, for this year we might expect a shocking 206 unexpected deaths including natural causes. That will be an increase of 31% in just one year. 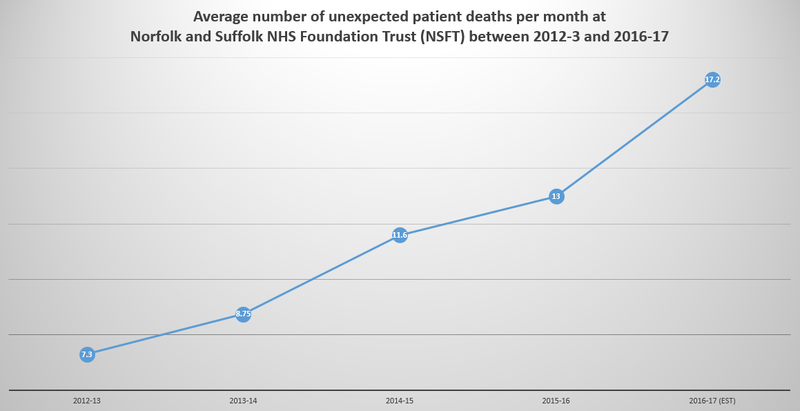 So, how can NSFT claim that there is no trend in unexpected deaths? 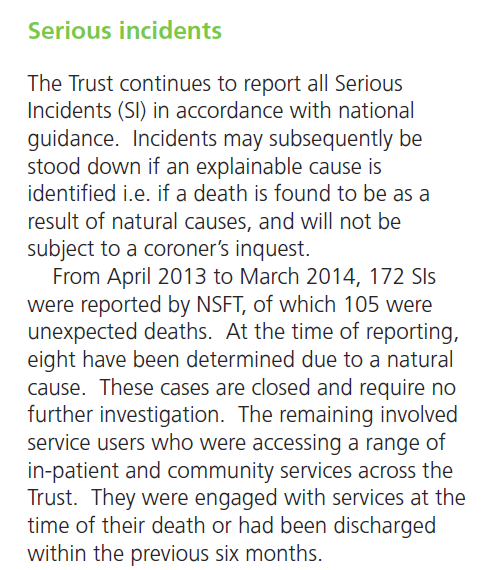 Does NSFT’s claim that ‘90% of SIs are unexpected deaths’ have any basis in fact? 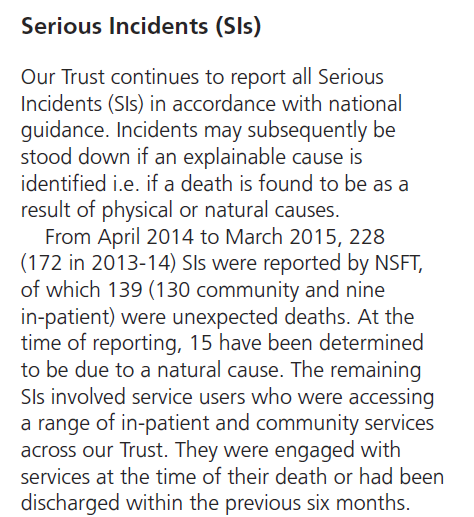 Why does the NSFT Quality Report focus on the number of SIs rather than the number of unexpected deaths? Since 2012/13, the number of SIs has increased by approximately 59%. But the number of unexpected deaths has increased by 134%, more than twice the increase in SIs. Four years ago, less than one hundred patients under the care of NSFT died. This year there may be more than 200. NSFT initially refused to release information on unexpected deaths to the public. The number of unexpected deaths has disappeared from the Quality Dashboard published in the papers for NSFT’s Board of Directors meetings. 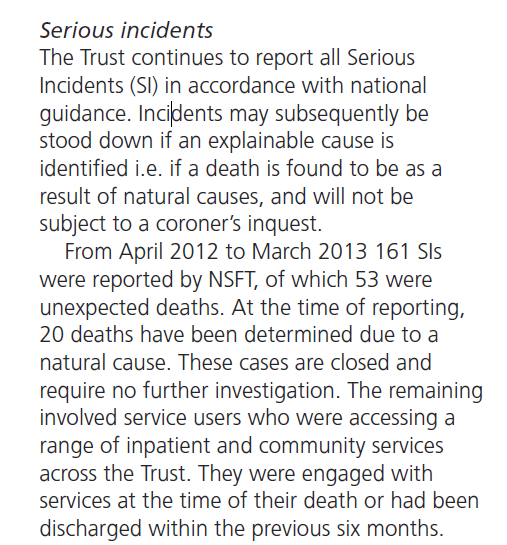 The Quality Report to the NSFT Board does not contain the latest information about SIs and unexpected deaths. NSFT’s Chair, Gary Page, promised to publish the number of unexpected deaths each month on its website. It didn’t happen. When the Chief Executive of NSFT, Michael Scott, and the NSFT Patient Safety Lead, Michael Lozano, appeared before the Norfolk County Council Health Overview and Scrutiny Committee this month, Cllr Emma Corlett asked whether the way NSFT collates data or the criteria for SIs and unexpected deaths has changed since 2012. Michael Scott replied that it has not changed. Michael Scott’s report to the Board in these papers fails to mention that Norfolk County Council’s Health Overview and Scrutiny Committee (HOSC) was so unhappy with his evidence that it has written to NSFT to demand more information. It doesn’t mention our evidence presented to the HOSC that coroners have expressed more concerns about NSFT than any mental health trust in the country. But the committee’s chairman Michael Carttiss said he found it “extraordinary” that the Verita report found the board had been aware of unexpected deaths of patients, yet minutes from board meetings showed these deaths were not discussed. Is NSFT dishonest, incompetent or innumerate? What is not in doubt is that the Board of NSFT is in denial. Here is our chart of the number of unexpected deaths per month at NSFT. See if you can spot the trend that NSFT can’t. Isn’t it time for a public inquiry? We are pushing for an inquest, the head coroner in Suffolk says the quantity of drugs found in the blood demands an inquest and the trust insists that natural causes are the cause of death and no inquest should happen. I believe the numbers of natural causes are being manipulated by the trust and are not to be believed. Pneumonia needs to be examined, the circumstances that led to this may not be naturally occurring. It would be interesting to look at the age range of the people that died of natural causes and the nature of their deaths. And yes. A public enquiry needs to be held, restraints and over prescribing drugs has hit the headlines today, tactics used by the trust for some time. If we don’t stop this here other areas of the country will start to see a year on year increase in deaths of patients. The trust wants David’s death to be natural causes despite the ruling from the chief coroner in Suffolk. I wonder how many more deaths that they consider to be natural causes need to be investigated. A public enquiry needs to happen. Today national news exposes over prescription and restraints are increasing, tactics used by the trust for a long time. They need to be held to account to stop other parts of the country following suit and just allowing their patients to die. I would like to know how much is the cause of increase in deaths due to the shortage of experienced and qualified staff, how much is due to the lack of psychiatric beds in the NHS in Norfolk and Suffolk, and how much is due to the massive pressure on the Trust’s Crisis and Home Treatment Teams; for example, there used to be two Crisis Teams covering Central Norfolk, now there is only one, and they lack the resources of inpatient beds which often could be used when suicide was a serious risk. What about the closure of the hostels? Also is it helping to have so many agency staff covering inpatient servicing, who lack the knowledge of patients that experienced staffs used to have. Is the Training in suicide risk used sufficiently for all staff and is it as effective as it used to be? Risk assessments have to be beyond tick-box completion. I’ve just read today’s Guardian where on Page 2 there is a report about the death of a 15 year old boy, Christopher Brennan, who died in Bethlem Royal Hospital Psychiatric Adolescent Unit. He had been admitted 6 weeks earlier as his family and local mental health services felt they were unable to keep him safe at home. The coroner has commented that the lack of resources for children’s mental health services is a ” NATIONAL scandal”. Christopher was one at least 11 young people to die in psychiatric units in England between 2010 and 2014. There is no mention in the article of how many young people have died who could not be admitted to a psychiatric unit. This hospital is run by South London and Maudesley NHS Foundation Trust. The coroner found that no formal risk assessment was carried out during Christopher’s time in hospital, and according to the charity, Inquest, there was also no care plan in place for this young man. Deborah Cole, the Charity’s Director, said ” The lack of resourcing of child and adolescent mental health services across the country is a national scandal. ” She calls on the government to set up an urgent independent review. Time for NSFT to stop denying that these deaths are due to a significant lack of essential resources.